When the Schools are in term the motor traffic is usually 10% heavier and its much less pleasurable for a training ride. Naturally the earlier you can get out for a ride the more enjoyable it will be. Saturday is by far the worst day for a pedal and being home by 9.30am is essential. The Spit Bridge is best used from the western footpath via the Seaforth shops approach. Be careful if you are riding towards the City as the Bridge footpath itself can be very slippery after rain. these rides are updated (for the next week) in the News Section of this website every Monday morning. When BiciSport members are riding on public roads they need to develop adequate cycling skills for the safety of themselves and other road users. Team members must abide by the road rules just as motorists do. Cyclists must stop at red traffic lights. When the cycling bunches are larger, riders may have to separate to obey the red traffic signal, so communication between riders is very important. Refrain from following poor cycling conduct (especially when wearing the sponsor`s team clothing). Understand that your cycling conduct is an example to other cyclists in the group. Assist the group safety by alerting following riders of dangerous potholes or debris on the road. You can alert other riders by pointing to the pothole, or simply yelling out a word of caution. BiciSport team clothing is a very smart looking kit - it is not compulsory to wear BiciSport team clothing on group rides. always bend your elbows slightly to steer the bike with your hands/fingers. Stiff or straight elbows means your collarbone does the steering (if that`s the case, you`ll never ride a straight line in a bunch). If you are group riding and want the benefits of the insurance cover, then it is highly recommended you maintain a formal training log approved by your coach (and always in writing [via email]). BiciSport conducts regular group rides and these rides are updated (for the next week) in the News Section of this website every Monday morning. Hosted by Lidcombe Auburn Cycling Club around the Sydney Olympic Park region offers numerous cycling options. Rides can alternate around the Olympic venues themselves or you can venture down to the Parramatta River bike paths. Sydney Olympic Park rides operate Tuesday, Wednesday and Sunday. Centennial Park is a popular training venue in the centre of Sydney. Tuesday & Thursday morning all year round - from 5.45am until 7.15am/7.30am. Summer rides are Wed/Thurs/Friday and the group forms up from approximately 4.15pm until 6pm. Thursday is the much harder day. Winter the rides are Tues/Wed/Thurs. Bunch sizes are restricted to 16 riders per bunch & 30kph by the CP Park Rangers. Best days are Monday to Friday, Saturday is overly congested (especially before lunch) and Sunday can be a lottery (either good or bad with congestion). M7 Cyclepath - offers safe cycling for 40k each way (80k in total) but caution needs to be taken through the numerous corners. The corners are mostly 'blind' with poor line of sight and extreme caution is needed especially if wet. The M7 cycle path offers some of the best car free cycling in Sydney. The cycle path is 40k in length (each way), so from Bella Vista/Glenwood it is an 80k round trip. Saturday car trips along Military Rd (through Mosman) now exceed mid week numbers ! the Saturday cycling strategy - get out & back as early as possible to maximise the enjoyment. Certainly, any return journey after 9am will become something less than pleasant. The Saturday experience is best served before 8.30am, as the Saturday traffic crush through Collaroy, Dee Why and Brookvale becomes very heavy from 9.00am. The recommended McCarrs Creek loop is - Pittwater Rd going north, then veer left onto McCarrs Creek Rd at Mona Vale, through Church Point, and return via Forest Way and Allambie Heights Rd (down to Manly Vale). The new SupaCentre Complex at the corner of Forest Way/Mona Vale Rd attracts considerable traffic on a Saturday after 9.00am, and Forest Way is most unpleasant near the Warringah Rd interchange after 9.00am. Collaroy Plateau Loop (if going north) - use South Creek Road towards Cromer, onto the Rose Avenue climb to the top of Collaroy Plateau. Caution needs to be exercised on the Veterans Parade descent towards Narrabeen. Ocean Street Narrabeen Loop (if going north or south) - use Ocean Street along the Narrabeen Peninsula, across Narrabeen Lakes bridge, then Sydney Road towards Mona Vale Hospital. The traffic congestion between Narrabeen Bridge & Powderworks Road is heavy (in both directions) in the morning & afternoon peak, and the Ocean Street Loop is the best alternative during these peak times. Dee Why Beach Loop (if going south) - turn left into Howard Street, then Griffin Road, over the Dee Why Beach climb, then beside Curl Curl Beach, Carrington Parade, then Harbord Diggers Club and Freshwater Beach. Avoid the Warringah Mall area at all costs. Alternatives to Spit Bridge include using Battle Boulevarde (via the Seaforth shops), and use the western footpath across the Spit Bridge (note - the Bridge footpath itself can be very very slippery when damp or wet when you`re heading south - so don`t jump on the front brakes, as a crash will result). Military Rd through Mosman is unpleasant in a car on Saturday after 8.30am, let alone on a bike. There are several parallel route alternatives to Military Rd, both on the eastern and western sides of Military Rd. Recent RMS statistics confirm more car trips along Military Rd through Mosman on a Saturday than mid week. The Saturday strategy seems to be - get out early, and be home before 9.30am at the latest. Without doubt the most dangerous bit of cycling real estate on the northside. Warringah Road (in either direction), from Forest Way to Allambie Heights Road, is a total no go zone at all times. Morgan Road Loop - cut across Warringah Road at the Government Road intersection, then use Oxford Falls Road, briefly onto Wakehurst Parkway going north, before turning left onto Oxford Falls Rd again, past the Optus Earth Station, climbing the steep Morgan Road climb to Forest Way. Wakehurst Parkway looks reasonably safe for cycling (with a wide side verge), but the Parkway has serious car accidents on a regular basis near the Deep Creek area (just near the narrow bridge). The Parkway from Narrabeen to Frenchs Forest is best avoided at all times, and despite Pittwater Rd carrying a lot of traffic, the Pittwater Rd alternative is generally considered a safer option. Finally, the other total "no go zones" are Mona Vale Rd (from Terrey Hills to Mona Vale) past the Bahai Temple, and either side of Roseville Bridge. Both are major arterial roads carrying excessive amounts of traffic. The (steeper) Cottage Point Inn side has seen numerous crashes, especially on the bumpy, straight section of road 500m before the Cottage Point Inn turnoff - extreme caution is required at all times on what looks like a totally innocent straight stretch of road. This dangerous Cottage Point Inn area now has had some of the bumps `smoothed` and `caution` signs erected on the left hand side of the road. However, the road surface near the Cottage Point Inn turnoff remains of very poor quality. The right hand corner half way down the descent (with the rock wall on the left) has claimed numerous victims especially in the wet. The (flatter) descent into Akuna Bay is from the West Head side - the road is bumpy in parts, with one right hand corner half way down requiring particular caution. This popular training road looks pretty straight forward, but the road edges of both descents have degenerated considerably over recent years. Riders regularly go "rubber side up" on the steeper Mt Colah side, and more so than ever there seems to be `just one proper line through the corners`. The last left hand corner into Bobbin Head itself is particularly dangerous (especially if damp). Local "boaties" regularly drop oil on the road from towing their boats, and the road is often littered with branches after a heavy wind. The descent on the Turramurra side is comparatively safer than the Mt Colah side, but the road is still very bumpy in parts, especially through the corners, and the road edges are poor. The West Head Rd was resurfaced in August 2009, and the loop is just 14k each way (28k back to the Akuna Bay road intersection), with 11 climbs in total - 5 climbs each way plus the steep Commodore Heights climb. This is possibly the best cycling real estate in Sydney, especially after the new road surface has gone down. The very end of the West Head loop is the only serious traffic blackspot - the steep descent into Commodore Heights is greeted with a near impossibly sharp right hand bend with no camber ... the descent into Commodore Heights is incredibly quick, but the road narrows and the right hand bend has absolutely no camber. This right hand corner has claimed numerous victims over the years, and the steep descent needs to be taken under `full brakes` or a major accident is a certainty at the right hand corner. Northside club racing events avoid this nasty right hand corner altogether (club races do a u-turn at the NP&WS Rangers Station at the Resolute recreation area). Mobile phone reception on the West Head Rd is very poor & be mindful of wallabies & kangaroo`s crossing the road. McCarrs Creek Rd is hugely popular with cyclists, especially on weekends. The McCarrs Creek descent towards Church Point is not particularly dangerous, but can be narrow in parts. When descending towards Church Point, be mindful of oncoming motor vehicle traffic moving out to overtake cyclists climbing back the other way - especially Saturday & Sunday mornings. The road surfaces & edges east of Bayview are sub standard, with numerous potholes & uneven surfaces. Galston Gorge is best avoided at all times except for early on a Sunday morning. Neither side of the Gorge is particularly dangerous but heavy traffic (especially during mid week peak hours and Saturday) ensures the roadshould be best avoided - best option is to go via Berowra Waters Ferry from the Berowra side. The Berowra Waters descent from the Berrilee side requires care, especially after the road narrows approximately 2 kilometres from the top. Three rock quarries operate `6 days per week` near the Calga interchange at Jones Road, Peats Ridge shops and at Kulnurra (5k west of Peats Ridge towards Wollombi). The quarry trucks can pose a serious safety issue if you are training on the Calga-Peats Ridge Road, and nearby Wisemans Ferry Rd at Somersby, especially from Monday to Saturday. Sunday is the best day by far. From Cowan to Calga is a major safety issue, especially on Sunday after 8.30am. To improve road safety the Old Pacific Highway is now a 80k speed limit zone from Cowan to Brooklyn, and a 60k speed limit from Mooney Mooney to Calga. However, these speed zones don`t stop random acts of total motorcycle stupidity (several white crosses along the Highway verges are testimony to their behaviour). Pedal cyclists are well advised to ride single file on certain sections of this Cowan-Calga road to allow room for considerate motor cyclists to pass safely (and give the crazies even more room). Police regularly patrol this stretch of road from Cowan to Mt White. The Old Pacific Highway through the small Cowan village has been reduced to one lane each way, and a cycle lane has been provided. The issues with ignoring red traffic lights as a cyclist are simple - you`ll get killed eventually (that is a certainty), and the period before you get killed gives all the motorists a really poor public relations experience. The additional downside - all done while wearing your sponsors team clothing. In short, its a dumb thing to do. ROAD SAFETY - HOW AWARE ARE YOU ? How aware are you of your safety when you go for a training ride or you need to do some hard interval efforts on your favourite hill ?. Are you aware that the road you`re on maybe isn`t the best place to be at that particular time of day ?. As an example ... riding along Military Road through Spit Junction maybe safe on a Sunday morning at 7am but could be considered sheer cycling lunacy at 11am on a Saturday morning. So, when you jump on your bike next time please give the safety aspect your full attention ... is this road bike safe at this time of day ? ... am I wearing bright & easy to see bike safe clothing ? (black jerseys make no sense full stop) ... are the roads slippery and greasy from overnight rain ? ... if it is greasy where are those slippery white lines to trap you out ? ... should I use a flashing tailight even in the daytime if cycling on heavily trafficed roads ? Sydney traffic is verging on the totally insane, with January the best month (everybody has gone away on holidays), with February & March the worst (everybody is back). The recent tragic cyclist fatality on the top steep section near the Pacific Highway always merits the most extreme caution. Cyclist speeds over 65k are easily achieved near the top which then causes issues further down the climb with motor traffic. 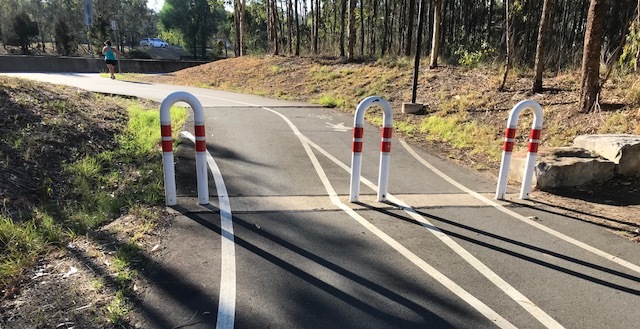 As reported in the NorthShore Times there has been complaints about cyclists riding two abreast on both sides of Bobbin Head. Unclear if the complaints are from local residents (which appears unlikely) or drivers using the National Park as a rat run shortcut to avoid Hornsby. Either way the issue has appeared in the local northside media. This section of road is now a designated 80k zone (from Cowan to Brooklyn), and a 60k zone (from Mooney Mooney to Calga) to primarily prevent motorcycle fatalities, but the old Pacific Highway remains very popular with motorcyclists for the purposes of undertaking random acts of total stupidity (especially from 8.30am on a Sunday morning). The corners approaching Mt White now have high quality smooth bitumen to prevent motorcyclists from falling off, but this seems to just make motorcyclists go faster, and fatalities continue. Pedal cyclists are best advised to go single file wherever appropriate & give the considerate motorcyclists room to overtake safely. Cyclists have been seriously injured after collisions with wallabies on the West Head Road. You need to be very unlucky, but it happens more times than you think. A long term black spot and still extremely dangerous, especially with the new faster road surface. The right hand corner at the end of the Commodore Heights dipper can be fatal. If you ever want to be scared to death, then try riding down Forest Way mid week. The single bike lane is not much comfort with heavy industrial traffic now stampeding down Forest Way. The 80k speed limit looks optional, and the sight of big `B Double` trucks tailgating each other past the Belrose lights is simply scary. These trucks have absolutely no regard for cyclists in the bike lane. Numerous potholes on the road from Peats Ridge to Calga is a shocker - the rain & quarry trucks have ruined the road on both sides.